Foreign visitors to a part of central London are being warned about the dangers of visiting clip joints. Westminster City Council wants to stop tourists being exploited by the establishments in Soho. The council said the venues typically advertise £5 for a show but then they are charged for extras and people often ending up paying hundreds of pounds. Leaflets, written in a number of languages, warning men of the scam are being distributed in the area. There are currently three clip joints left in Soho, with two located on Great Windmill Street next to Soho Primary School. 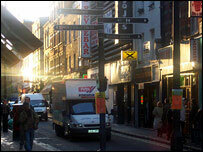 Councillor Audrey Lewis said: "The few remaining clip joints in Soho cause a huge amount of distress and do serious damage to the reputation of the area. "Their sole purpose is to trick unsuspecting men into parting with hundreds of pounds. "I am sorry for the silly men who get taken in by this and for the pathetic girls touting outside suggesting that there is gratification to be had. "I am also sorry that it has a knock on effect on the residents of Soho as a whole. But what I mind most is that this sleazy operation takes place a few feet from a primary school. The weekend leafleting was part of Operation Vardar, a Metropolitan Police-led initiative aimed at tackling crime and disorder in the West End.